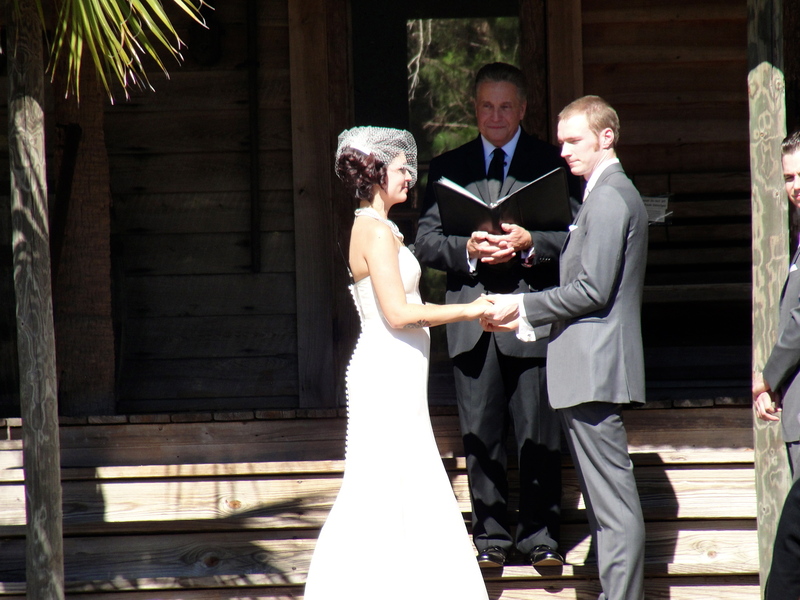 Fort Christmas Park, in Christmas, Florida is a wonderful and picturesque venue for a wedding ceremony. Victoria and Michael found it by searching the internet and finally focusing on the serene and natural setting that would be the venue for their wedding ceremony and celebration. They were married by Sensational Ceremonies officiant Lon Tosi on a warm sunny afternoon in February on the front steps of a settler’s cabin. The bride and groom wrote love letters to each other and placed them into a wine box for opening on their wedding anniversary. They also shared their reasons for wanting to marry each other during the ceremony. Their rings were passed among their audience members for “Warming” with their best wishes for the couple’s future. The couple shared a lunch with their guests under a pavilion with the sun shining through the festivities. Overall, it was a glorious day for a wedding. It was warm, bright and happy! Best of luck Michael and Victoria! And, thanks to Fort Christmas Park for providing such a fantastic setting.